From the time that pages of The Saint John's Bible began touring in major exhibitions nearly a decade ago, people have been moved, captivated, and inspired by this stunning work of modern sacred art. But they often have questions about the illuminations that are scattered throughout the Bible, especially as they first become familiar with it. Why was a certain Scripture passage chosen for illumination rather than another? What materials and source imagery are behind the illuminations? The Art of The Saint John's Bible provides answers to these important questions and many others. Initially published in a series of three volumes, each book has now been revised by the author and included together in this helpful single volume. Since The Saint John's Bible is now complete, Susan Sink makes connections between recurring images and motifs throughout the work and reflects on the images with a view to the whole. Her book promises to intensify and expand the experience of all who come in contact with The Saint John's Bible. By its sheer beauty and craftsmanship the Saint John's Bible compels its viewers to stand in awe. 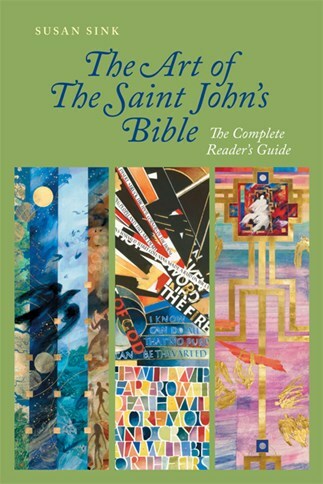 That experience will be further enhanced when readers have in hand Susan Sink's The Art of the Saint John's Bible. She presents us with finely crafted answers to questions we might not have even been aware we were seeking. Why that image? Those colors? How did they . . .? A solid contribution to an epic enterprise. In The Saint John's Bible the art, plentiful and beautiful, is not there as decoration or even as illustration: it is there to illuminate, to light up Holy Scripture from within. It is sacred art, focused intently on Sacred Revelation. Susan Sink's magnificent book is above all a biblical book. She leads us into every section of the Bible, puts it in context for us, and makes clear how the art springs from and refers back to a salvific meaning. It is a book almost impossible to comprehend; it does not ask us to comprehend. What it does ask is that we open our minds and hearts and allow the Word of God, written, drawn, and painted, to transform us. These pages are not for mere reading. They are for lectio divina, as befits a Benedictine book.